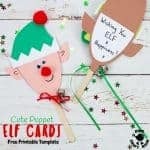 This Round Santa Christmas Cards Craft is super fun for kids and grown-ups and so adorably cute! 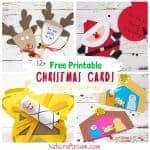 These handmade Santa cards are really easy to make with the free printable template and everyone is bound to love them. Who could resist such a round jolly Santa Claus design? 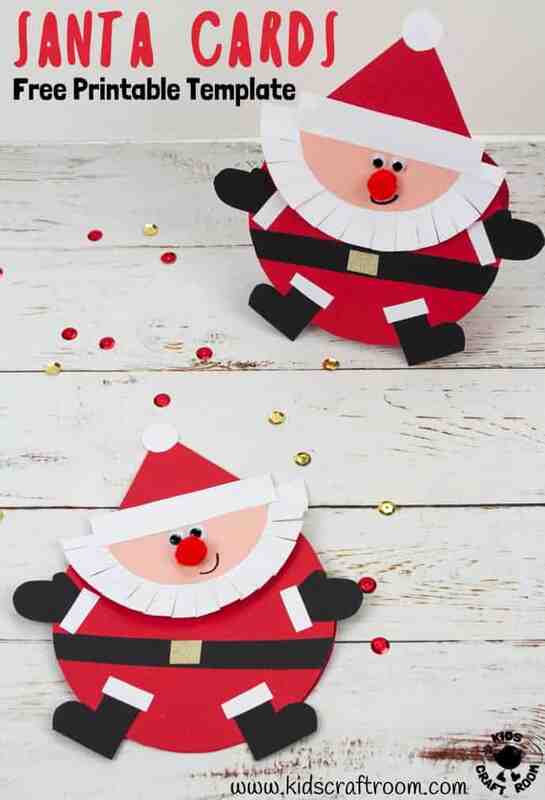 The Printable Santa Card Pattern can be used in two ways. 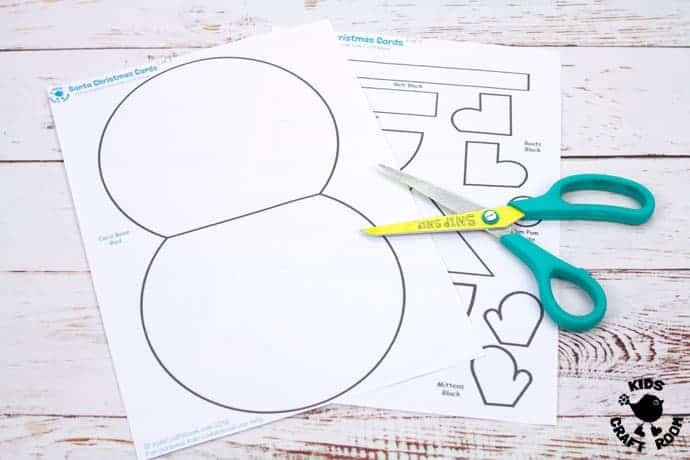 You can either trace around it onto coloured card or use it as a colouring sheet to cut out and assemble after you’ve coloured it in. It’s always lovely to receive handmade greeting cards and gifts isn’t it? I prefer them to shop bought any day! If your family is anything like mine then you keep as many of your kids homemade cards as you can. I can’t believe that my mum still has some that I made for her when I was about 4 years old! 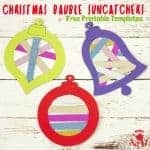 So download your free Santa card pattern and have fun getting creative. 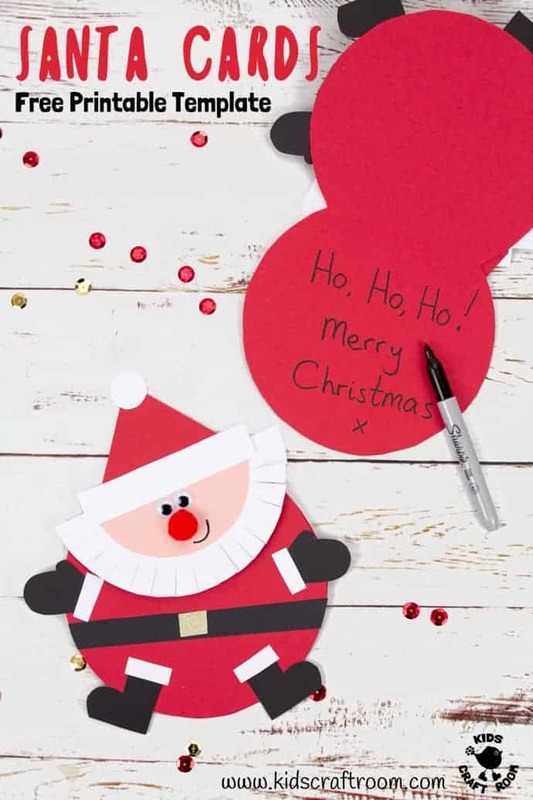 These handmade Santa cards are sure to delight everyone lucky enough to receive them. 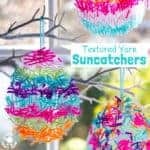 If your kids make them I wouldn’t be surprised if they get kept as keepsakes to treasure in years to come! 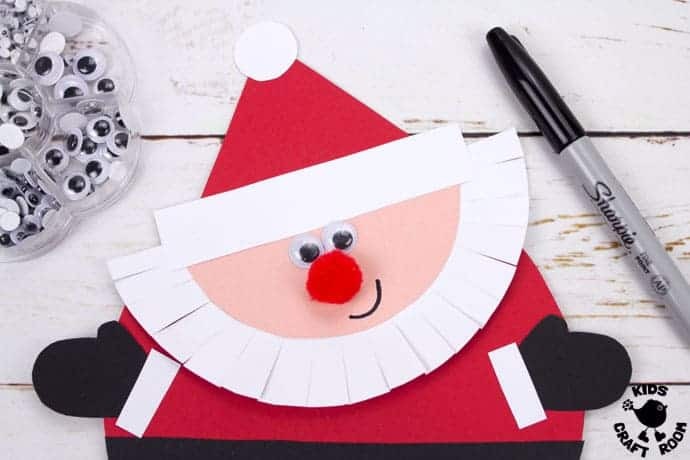 We adore making Santa crafts and have a whole Pinterest board dedicated to them. 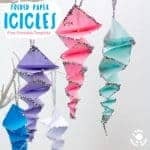 So if you are looking for more Santa craft ideas do follow it. 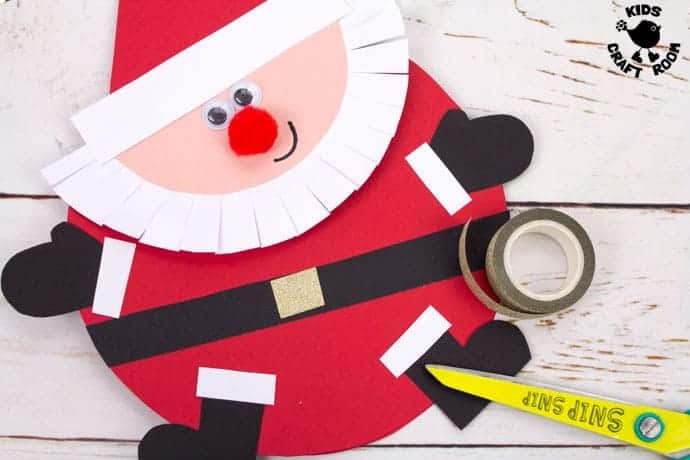 And do take a peek at our favourite Father Christmas ideas from here on Kids Craft Room too. 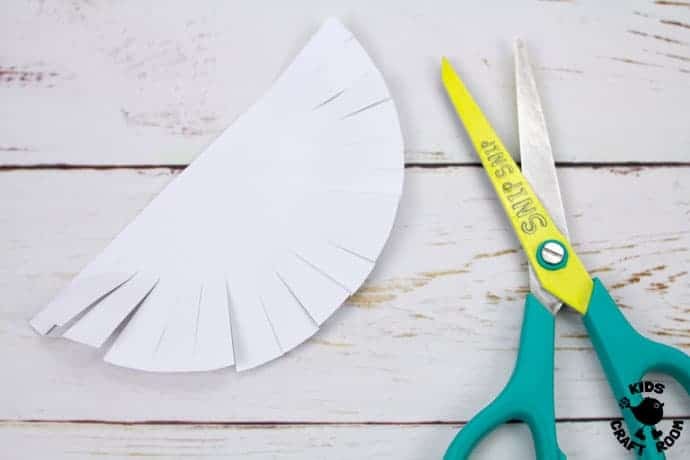 Readers have loved our Trim Santa’s Beard craft which is a fun way for kids to practise their scissor skills. 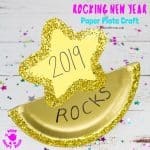 Santa Finger Puppets are great for encouraging imaginative play and story telling and there’s a free printable template too. 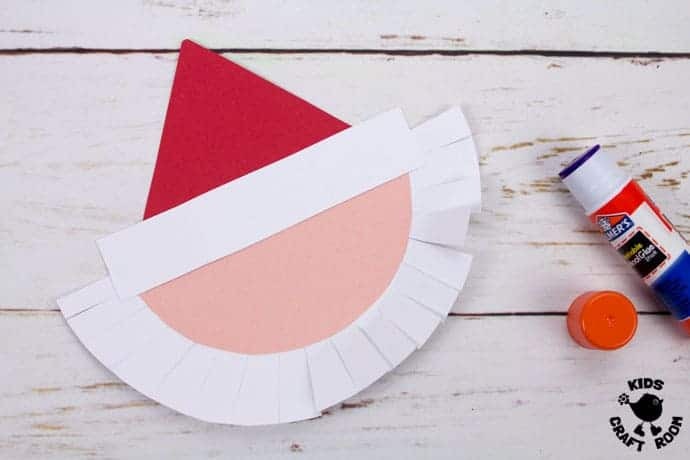 If you’re looking for a Santa card idea for tiny tots Mum In The Madhouse has a cute 5 Minute Santa Hat Card you might like. 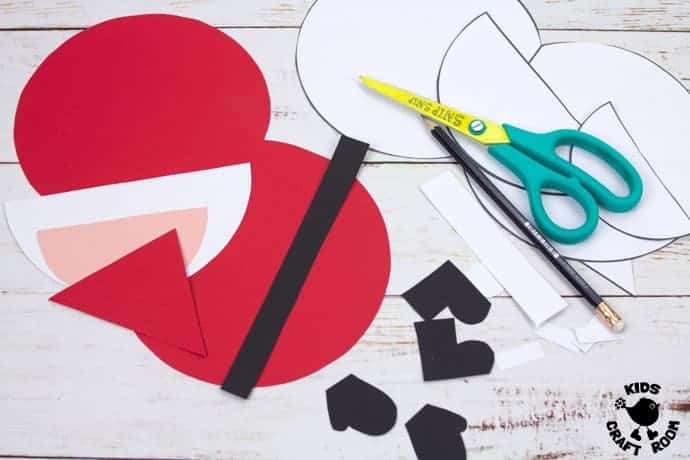 2 – Either colour the pieces in and then cut them out or trace around them onto coloured card and cut them out. You’ll have a red round body and triangle hat. Black mittens, boots and belt. White beard, pom pom, hat trim and little mitten and boot trims. 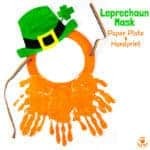 Also a semicircle skin coloured paper face. 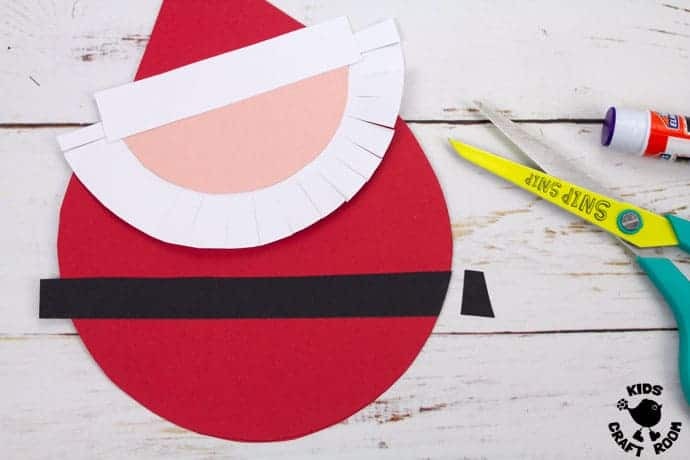 3 – Snip all around the edge of the large white semi circle to give texture to Santa’s beard. 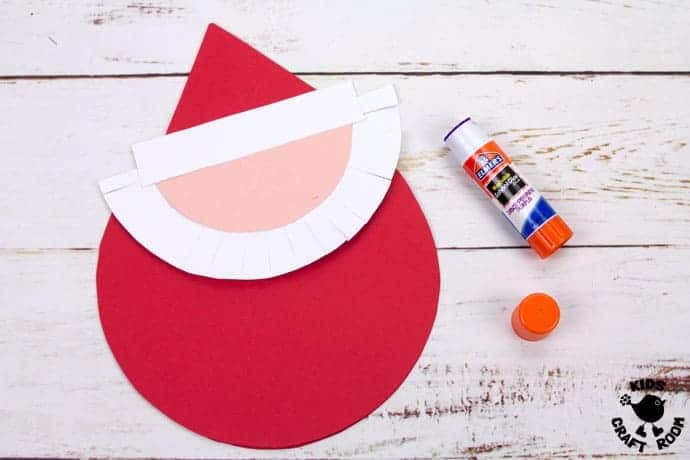 4 – Glue on Santa’s face, red hat and white hat trim. 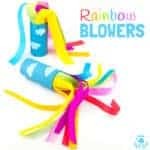 5 – Fold the round body pieces in half to make a card that opens and shuts with the hinge at the top. Glue Santa’s head onto the hinge. 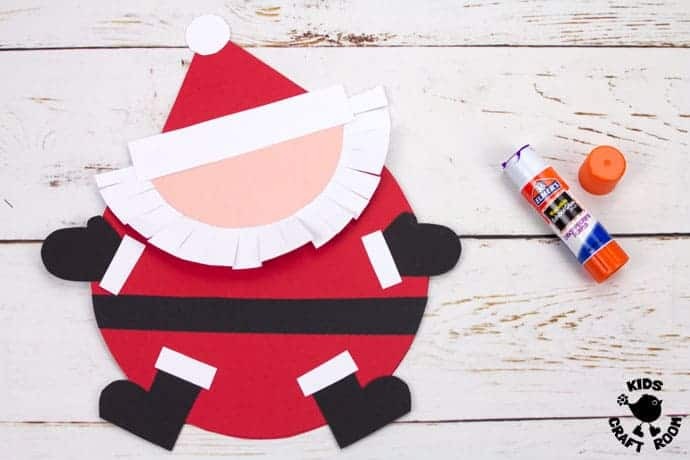 6 – Glue on Santa’s black belt and trim off any excess. 7 – Glue on Santa’s mittens, boots and their white trim. 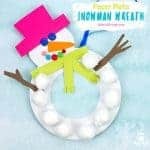 Add the white pom pom to Santa’s hat. 8 – Either draw on Santa’s face or use wiggle eyes and a red pom pom nose. 9 – Add a sparkly gold tape buckle to Santa’s belt. 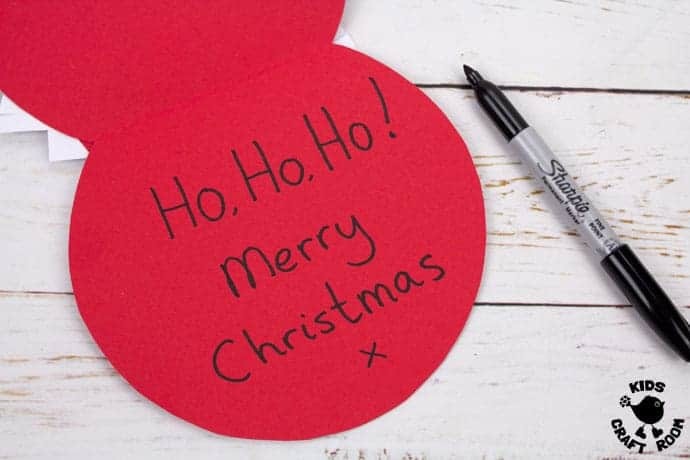 10 – Finish off your Santa Christmas Cards by opening them up and writing your greeting inside. 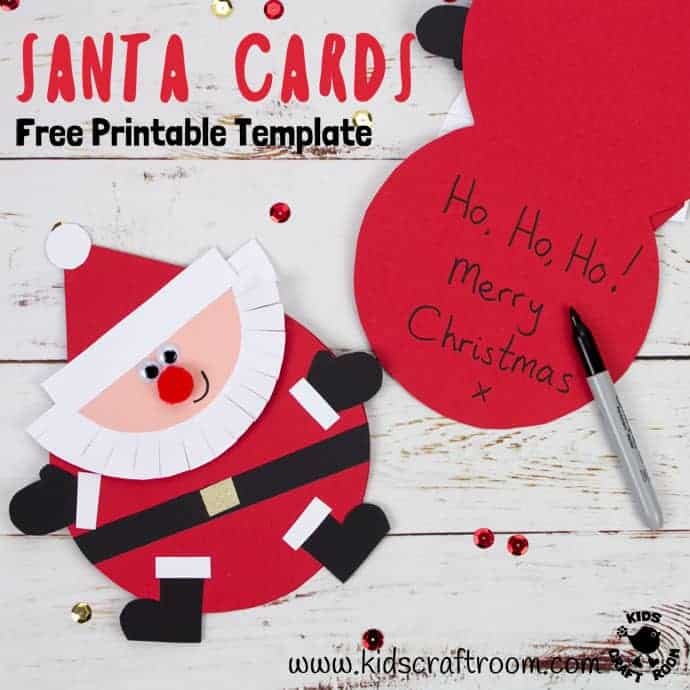 Click Here To Get Your FREE Santa Cards Printable Pattern. 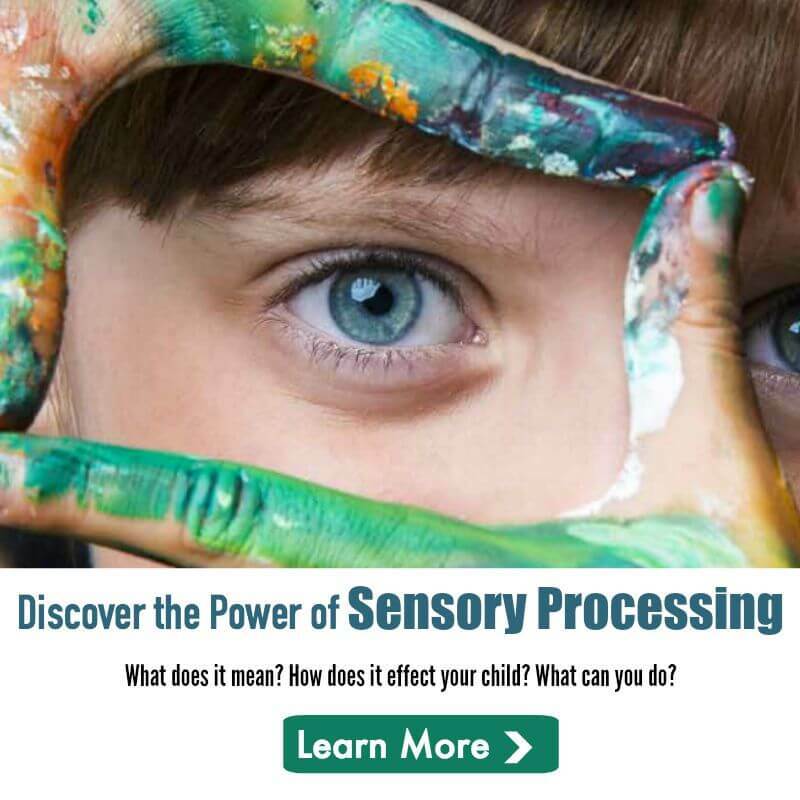 Put it in your basket, add your email address and check out. 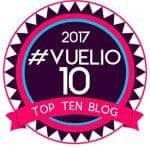 Your download link will be sent straight to you. 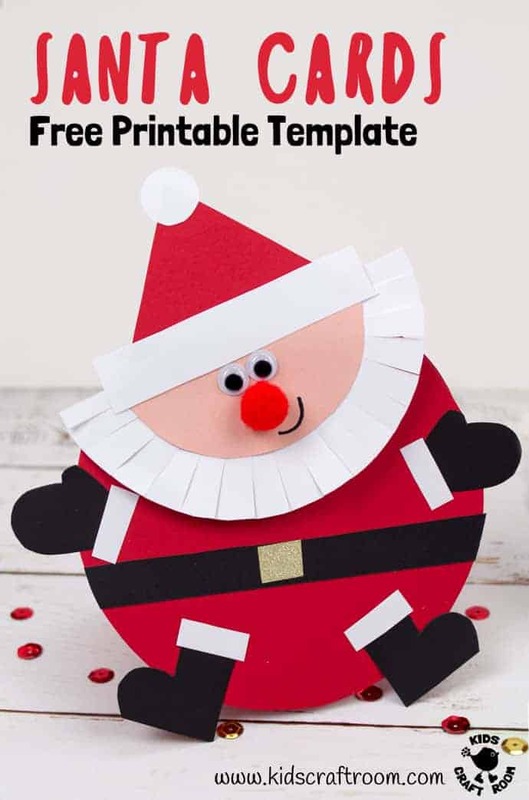 Download and print the Free Santa Christmas Card Template. Either colour the pieces in and then cut them out or trace around them onto coloured card and cut them out. You'll have a red round body and triangle hat. Black mittens, boots and belt. White beard, pom pom, hat trim and little mitten and boot trims. Also a semicircle skin coloured face. Snip all around the edge of the large white semi circle to give texture to Santa's beard. Glue on Santa's face, red hat and white hat trim. 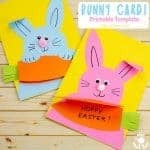 Fold the round body pieces in half to make a card that opens and shuts with the hinge at the top. Glue Santa's head onto the hinge. Glue on Santa's black belt and trim off any excess. Glue on Santa's mittens, boots and their white trim. Add the white pom pom to Santa's hat. Either draw on Santa's face or use wiggle eyes and a red pom pom nose. Add a sparkly gold tape buckle to Santa's belt. 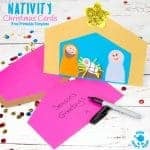 Finish off your Santa Christmas Cards by opening them up and writing your greeting inside. It’s beautiful. 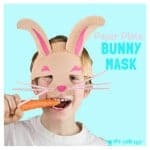 I want to try to make it.